An ounce of prevention is key. As the temperature rises and you start spending more time outside (woo-hoo! ), the fun factor in your life can rise exponentially. Unfortunately, so can the risk of suffering from summer beauty hangovers. The truth is, many things can (and often will) go wrong, beauty-wise, while you're happily engaged in summer activities. Here are tips to help you dodge some of the biggest summer beauty bummers. Foot rebellions: If you get a blister from wearing sandals or too-tight shoes that rub your feet the wrong way, clean it with soap and water (or rubbing alcohol), apply an antibiotic ointment like Bacitracin, and cover the blister with a bandage. To prevent further irritation or more blisters from forming, place a moleskin pad between the point of friction and the shoe, advises Leslie Baumann, M.D., a dermatologist in Miami and author of The Skin Type Solution. Humidity-induced hair frizz: An ounce of prevention is key — so apply a smoothing balm like Phytodéfrisant ($16) to your hair before blow-drying, curling or using a flat iron on it. Afterward, rub a small drop of styling serum in your palms ‘til it emulsifies and then work it through the hair, concentrating on your frizziest spots, advises Mark Garrison, owner-stylist at the Mark Garrison Salon in New York City. Use it sparingly or your hair will end up looking greasy. “It’s always better to start with a small amount and use more if necessary,” he says. Straw-like strands: If your hair tends to get fried or frayed after you swim in the ocean, wet it thoroughly and apply a leave-in conditioner or conditioning oil — such as Aveda Sun Care Protective Hair Veil ($29) or Phyto Plage Protective Sun Oil ($30) — before you take a dip. 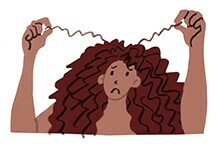 “Because oil repels water, your hair will be shielded from salt water getting into it,” Garrison explains. Afterward, immediately wash and condition your hair. “The most brutal thing to hair is sitting in the sun after going in the pool or ocean — the sun will really dry out your hair!” he says. At the very least, cover wet hair with a hat. Body breakouts: Hot weather, humidity and sweating are the perfect trifecta for causing more oil and dirt to get trapped on the skin, says Joshua Zeichner, M.D., director of cosmetic and clinical research in dermatology at the Mount Sinai Hospital in New York City, “so it’s important to effectively remove dirt and oil to prevent pores from becoming clogged.” Use a cleansing product that contains salicylic acid — such as Neutrogena Oil-Free Acne Wash Pink Grapefruit Foaming Scrub ($8.50) or CeraVe Renewing SA Cleanser ($10) — to remove excess oil from the skin, exfoliate dead skin cells, and help keep your skin clear. Rash results: If you develop an irritation along the bikini line after shaving, depilating or waxing, apply a topical hydrocortisone cream two to three times daily to calm the skin. (You can use the same strategy for a sun rash.) To prevent razor burn in the future, “always shave toward the end of your shower and use a shave gel to soften the hair and enhance the glide of the razor across the skin,” Zeichner advises. “Shave in a single direction, usually with the grain, to minimize the risk of irritation.” After hair removal, apply a calming lotion with colloidal oatmeal — such as Aveeno Daily Moisturizing Sheer Hydration Lotion ($9) — to soothe the skin. Color changes: Blonde hair, in particular, can pick up a green tint when exposed to the chlorine or metal ions (like copper) in pool water. To prevent this undesired effect, apply a leave-in conditioner and wear a swim cap before you take the plunge. After swimming, use a shampoo specifically designed to remove chlorine — like Paul Mitchell Shampoo Three ($11.50) or Ouidad Water Works Clarifying Shampoo ($10). For stubborn discoloration, head to the salon and get your hair treated with a soap cap — a very diluted mix of hair lightener in shampoo — to remove the green, Garrison says. Screaming skin: To calm lobster-red or angry skin after sunburn, take a nonsteroidal anti-inflammatory drug (like aspirin or ibuprofen) to reduce inflammation from the inside, Zeichner advises. “And apply a breathable aloe-containing product in the first 24 hours to soothe the skin without preventing heat from evaporating off the skin’s surface.” After 24 hours, slather on a bland moisturizing lotion — such as Vaseline Intensive Care Advanced Repair Unscented Lotion ($8). Skin sunspots: To prevent sun-induced brown spots on your face, make a habit of wearing a sunscreen with SPF 30 and a hat when you’re outside, Baumann advises. Also, consider taking Heliocare ($30), a dietary supplement that contains antioxidant-rich ingredients that help your skin protect itself from sun damage, she suggests. “Once you get brown spots, see your dermatologist — you might need a laser treatment or prescription-strength skin lightener such as [a preparation with] hydroquinone, a retinoid, and an anti-inflammatory.” That can help prevent you from being marked by the sun for life.